Local & International Infrastructural Support. The Company has involved in supply of material supply as well as distributorship of various products of leading manufacturers. Liaison with third parties for contract negotiations, bid preparation support & submission etc. The Company has a large fleet of various industrial machinery and equipment both for hire and sale. Apart from this BOS Trading UAE is also involved in supply of qualified manpower to the Power and Oil & Gas industry, material supply as well as distributorship of various products of leading manufacturers. Baku Oil Services LLC, registered in Baku Azerbaijan, was founded in mid 2005. The company comes with a wealth of experience accumulated by our Directors and technical staff over many years of execution of various projects ranging from Hot & Cold Insulation, Painting, Blasting & application of anti corrosive coats on various sites connected to the oil & Gas industry in Azerbaijan, Russian Federation & Kazakhstan.Baku Oil Services successfully undertook and completed the Sangachal Tanks painting and Blasting works for Entrepose Contracting (France), in close collaboration with Cape Industrial Services. In the recent past we cooperated with Cape PLC by supporting them with trained & qualified operatives as well as providing project supervision for hot and cold Insulation, Scaffolding, fire Proofing, blasting & painting works being carried out in Kazakhstan and Russian federation.All our specialist operatives are qualified at their trade and come with a very high safety awareness to meet the standards of the industry. It has always been our objective to work safely, with minimum downtime and ensure the highest standards of quality in all that we do. We have always placed the highest priority for localization in our work force and pride ourselves in having a very high percentage of Azeri professionals in all trades.Located close to the city, just 10kms away, on the main highway leading to the facilities of all the main oil and gas related projects currently underway in Baku, we are strategically placed to cater with speed and efficiency to the needs of our clients, be it due to the proximity to their city center offices or their warehouses, sites and yards in the outskirts along the Salyan Highway.We have invested approx. USD 10 million in the construction of our warehouses, workshop with overhead crane and a training center with fully equipped classrooms, machinery, equipment and office facilities. These facilities are custom built to ensure ease of operations, easy access, as well as keeping in mind not only the welfare of our staff and operatives but also the aesthetic upkeep of our surrounding area in line with our continual commitment to being environmentally friendly. 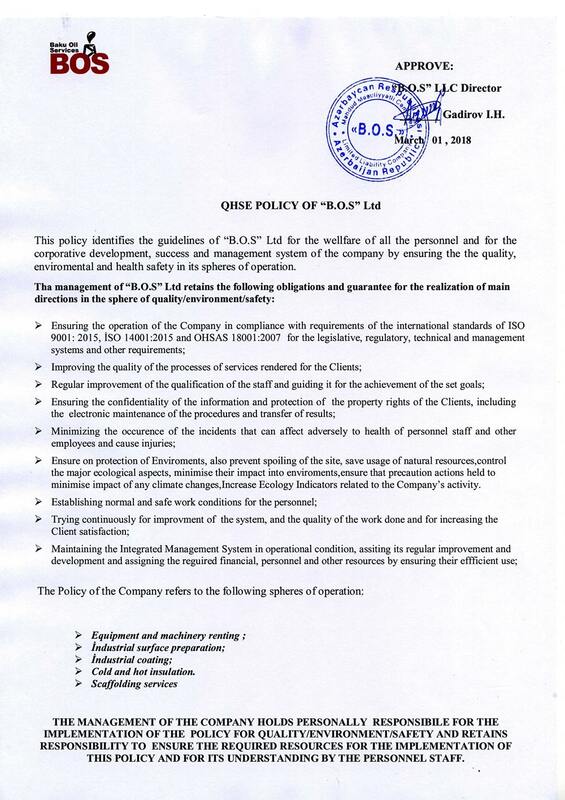 Continuous improvement of our company has been done in accordance with the requirements of ISO 9001-2008, ISO 14001-2004 and OHSAS 18001-2007 international standards for key areas of our activity in Quality, Environment and Occupational Safety and Health Management provided.In 2017, the company has undergone appropriate changes in Quality and Environmental Management systems in connection with the transition to new versions of ISO 9001: 2015, BS ISO 14001: 2015, and has been certified by International Certification Authorities for both standards in June of the current year.Starting from March 2018, the company has expanded its application of international standards ISO 9001: 2015 and BS ISO 14001: 2015 and OHSAS 18001-2007 Quality, Environment and Occupational Health and Safety Management System, and commenced certification on scaffolding scope of works. BOS Georgia LLC registered in December 2016, BOS Georgia LLC has participated as part of the subcontractor teams as well as independently in the execution of various services on the GPC pipelines, pumping stations and radio stations along the export pipeline. BOS KZ LLC were founded in September 2007. In Kazakhstan we have partnered with a prominent local company with over 20 years of experience in the region. Together we provide a variety of services to the energy, civil, construction and infrastructural sectors of this region. The combined expertise of these companies and the partners in the above mentioned regions are available to be called upon thus creating an effective and integrated solution to a wide range of industry requirements. The members of this group have successfully undertaken and completed various projects in the CIS. With the registration of BOS KZ LLP, the company provides products and services to a wider segment of the industry players in the region as well as develop a strong local base in Kazakhstan to cater to the downstream industry in the Oil and Gas sector. Currently we are in the process of establishing our client base within the region for the above mentioned products as well as getting a foothold for the provision of various services like training of specialists in insulation and GRP application, hot & cold insulation works, surface preparation, coating application, access scaffolding using local skilled and trained labors. BOS KZ LLP guarantees high class professional services bringing together the vast experience of its founders and partners and aspires to be the local One Stop Shop for all Industry related solutions in Kazakhstan. BOS Russia LLC registered in October 2018, BOS Russia LLC going to participate as part of the subcontractor teams as well as independently in the execution of fabric maintenance services on Oil & Gas Industry.